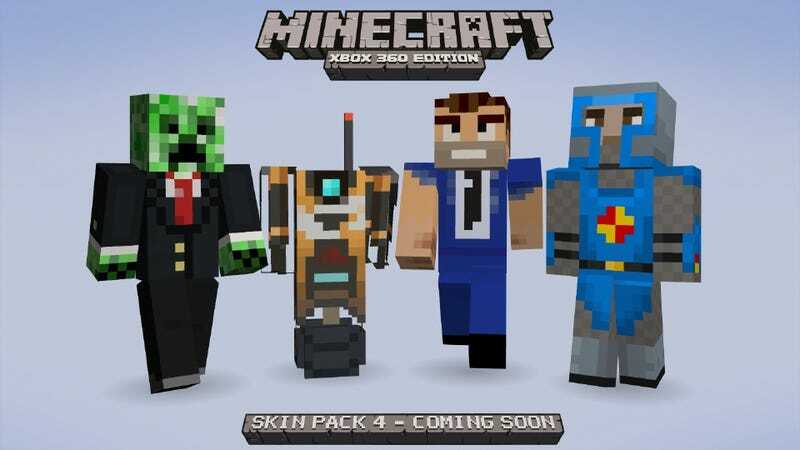 Minecraft Xbox 360 Edition is pouring on the fan service with this week's release of Skin Pack 4—providing delightfully low-res interpretations of Claptrap from Borderlands, Klei's Mark of the Ninja and The Behemoth's Castle Crashers, plus a whole lot more. • Brick, Mordecai, Lillith and Claptrap from the original Borderlands. • Altaïr, Ezio and Connor from Assassin's Creed. • Four Dragon Age-inspired skins. • Cole Train and Marcus Fenix from Gears of War. • Red and Blue Spartans from Halo. • The ninja from Klei's Mark of the Ninja. • Two of the warriors from The Behemoth's Castle Crashers. • Two skins from Charlie Murder by Ska Studios. • What appear to be Fruit Ninja and Jetpack Joyride skins, courtesy of Halfbrick. • And six generic animals. Skin Pack 4 arrives on Wednesday.